Microsoft allows a CA to use Cryptography Next Generation (CNG) and advises of incompatibility issues for clients that do not support this suite. What are the ideal settings for a Root Certificate with an expiration of 5, 10, and 15 years? Note: This is a (very very long) compendium of various recommendations and actions that Microsoft, NIST, and other well respected PKI and cryptography experts have said. If you see something that requires even the slightest revision, do let me know. Before I get into configuring the CA and its subs, it's good to know that even though MSFT's CryptoAPI requires a self-signed root, some non-MSFT software may follow RFC 3280 and allow any CA to be the trusted root for validation purposes. One reason may be that the non-MSFT software prefers a lower key length. Don't use 1024 as a key length... NIST phased it out in 2011, MSFT won't ever add it into your Trusted Root CA store since it won't meet the minimum accepted technical criteria. Root CAs that supports legacy apps should never be larger than 2048 bits. Reason: MSFT Support sees many cases where Java apps or network devices only support key sizes of 2048 bytes. Save the higher bit lengths to CAs that are constrained for a specific purpose (Windows vs Network devices) etc. The NIST recommends 2048 or 3072 bits. ECC is supported, though it may cause issues with device interoperability. Plan for the strongest possible encryption (key length) throughout the PKI, otherwise expect mixed security benefits. One approach is to establish what is the longest validity you'll require for end entity certificates, double it for the issuing ca's, and then double it again for root ca (in two tier). With this approach you would routinely renew each ca certificate when half of it's lifetime was reached - this is because a ca can't issue certificates with an expiry date after that of the ca certificate itself. Suitable values can only really be determined by your organisation & security policy, but typically a root ca would have a certificate lifetime of 10 or 20 years. If you're concerned about compatibility, set the expiration date below 2038. This is due to systems that encode a data as seconds since January 1st 1970 over a signed 32 bit integer. Read more about this issue here. You may want to imitate the Federal PKI Management Authority and set up two PKI roots. One modern SHA-256 for all devices that support it, and one legacy SHA-1. Then use cross certificates to map between the two deployments. As of 2012, this is required if you use MD5 as a hash. It's still a good idea if SHA1 or greater is used. Also see this Windows 2008R2 "how to" for more information. NOTE: In some situations, such as when digital signatures are used on binding contracts, the certificate practice statement can also be considered a legal statement about the level of security that is provided and the safeguards that are being used to establish and maintain the security level. For assistance writing a CPS statement, here is a Microsoft produced "Job Aid"
Best Practice: Although it is possible to put freeform text into this field (see notice below), the ideal solution is to use a URL. This allows the policy to be updated without reissuing the certificates, it also prevents unneeded bloating of the certificate store. Notice = "Legal policy statement text"
Also known as issuance policies, or assurance policies (in MSFT), this is a self defined OID that describes the amount of trust one should put into your certificate (high, med, low, etc). See this StackExchange answer for how to properly use this field. Application Policies is an optional Microsoft convention. 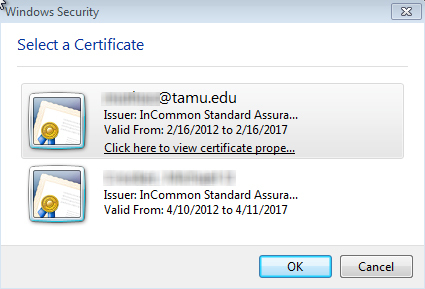 If you are issuing certificates that include both application policy and EKU extensions, ensure that the two extensions contain identical object identifiers. This is optional in a Root CA, and if done incorrectly it may expose your private key. It is perfectly acceptable to have the Root CA issue different CRL locations for each issued certificate to subordinate CAs. Having a CRL at the root is a best practice if two PKIs trust each other and policy mapping is done. This permits the certificate to be revoked. Getting the CRL "right" is pretty important since it's up to each application to do the CRL check. For example, smart card logon on domain controllers always enforce the revocation check and will reject a logon event if the revocation check cannot be performed or fails. Note If any certificate in the chain cannot be validated or is found to be revoked, the entire chain takes on the status of that one certificate. A self-signed root CA should not list any CDPs. Most windows applications don't enable the CERT_CHAIN_REVOCATION_CHECK_CHAIN_EXCLUDE_ROOT flag and therefore ignore the CDP (this is the default validation mode). If the flag is enabled, and the CDP is blank for the self signed root cert, no error is returned. Don't use HTTPS and LDAPS. These URLs are no longer supported as distribution point references. Reason is that HTTPS and LDAPS URLs use certificates that may or may not be revoked. The revocation checking process can result in revocation loops when HTTPS or LDAPS URLs are used. To determine if the certificate is revoked, the CRL must be retrieved. However, the CRL cannot be retrieved unless the revocation status of the certificates used by HTTPS or LDAPS is determined. Consider using HTTP instead of LDAP- Although AD DS enables publication of CRLs to all domain controllers in the forest, implement HTTP instead of LDAP for revocation information publication. Only HTTP enables the use of the ETag and Cache-Control: Max-age headers providing better support for proxies and more timely revocation information. In addition, HTTP provides better heterogeneous support as HTTP is supported by most Linux, UNIX, and network device clients. Make all the URLs highly available (aka don't include LDAP for external hosts). Windows will slow down the validation process for up to 20 seconds and retry the failed connection repeatedly at least as frequently as every 30 min. I suspect that Pre-fetching will cause this to occur even if the user isn't actively using the site. Monitor the size of your CRL. If the CRL object is so large that CryptoAPI is not able to download the object within the allotted maximum timeout threshold, a “revocation offline” error is returned and the object download is terminated. Note: CRL distribution over HTTP with ETAG Support may cause issues with IE6 when using Windows 2003 / IIS6, where the TCP connection is continually reset. (Optional) Enable Freshest CRL: This non-critical extension lists the issuers and locations from which to retrieve the delta CRLs. If the “Freshest CRL” attribute is neither present in the CRL nor in the certificate, then the base CRL will be treated as a regular CRL, not as part of a base CRL/delta CRL pair. Warning If delta CRLs are enabled at a CA, both the base CRL and delta CRL must be inspected to determine the certificate’s revocation status. If one of the two, or both, are unavailable, the chaining engine will report that revocation status cannot be determined, and an application may reject the certificate. The CRL will grow 29 bytes for every certificate that is revoked. Accordingly, revoked certificates will be removed from the CRL when the certificate reaches its original expiration date. Also consider partitioning the CRL more frequently if the expiration is more than 1 or two years, as the likelihood of revocation increases. The drawback to this is increased startup times, as each cert is validated by the server. If using a CRL, don't sign the CRL with MD5. It's also a good idea to add randomization to the CRL signing key. This field allows the Certificate validation subsystem to download additional certificates as needed if they are not resident on the local computer. A maximum of five URLs are allowed in the AIA extension for every certificate in the certificate chain. In addition, a maximum of 10 URLs for the entire certificate chain is also supported. This limitation on the number of URLs was added to mitigate the potential use of “Authority Info Access” references in denial of service attacks. The OCSP responder is conventionally located at: http://<fqdn of the ocsp responder>/ocsp. This url needs to enabled in the AIA. See these instructions for Windows. All OCSP actions occur over the HTTP protocol and therefore are subject to typical HTTP proxy cache rules. Specifically the Max-age header defines the maximum time that a proxy server or client will cache a CRL or OCSP response before using a conditional GET to determine whether the object has changed. Use this information to configure the web server to set the appropriate headers. Look elsewhere on this page for AD-IIS specific commands for this. The parent CA defines whether or not to allow CA certificate policies from sub CAs. It is possible to define this setting when a issuer or application policy needs to be included in a sub CA. Example polices include an EKU for SmartCards, Authentication, or SSL/Server authentication. If you use certificate policies, be sure to mark them as critical otherwise the computed valid_policy_tree becomes empty, turning the policy into a glorified comment. The original CCITT spec for the OU field says it should be limited to 64 characters. Normally, the CA enforces x.500 name length standards on the subject extension of certificates for all requests. It is possible that deep OU paths may exceed normal length restrictions. This feature assists where environments need to have two PKIs installed, one for legacy hardware/software that doesn't support modern cryptography, and another PKI for more modern purposes. In contrast with RFC 5280 that states “in general, [sic] the EKU extension will appear only in end entity certificates." it's a good idea to put constraints on the CA Key usage. A typical stand-alone CA certificate will contain permissions to create Digital Signatures, Certificate Signing, and CRL signing as key values. This is part of the issue with the FLAME security issue. It also has interesting constraints around validating EKU (link tbd). Use caution with Basic Constraints "Path"
The Basic Constraint should describe if the certificate is an "end entity" or not. Adding a path constraint to a intermediate CA may not work as expected since it's an uncommon configuration and clients may not honor it. If qualified subordination is done, revoking a cross signed root may be difficult since the roots don't update the CRLs frequently. People will interact with your certificate when importing it, reviewing imported certificates, and troubleshooting. MSFT's recommended practice and requirement is that the root has a meaningful name that identifies your organisation and not something abstract and common like CA1. Surprisingly, End users and technicians who don't understand PKI's nuances will interact with the server names you choose more often than you think if you use S/MIME or digital signatures (etc). It's important to tell the difference between a message that was encrypted between two parties, and one that was signed. One example where this is important is if I can get the recipient to echo a statement I send to them. User A could tell user B "A, I owe you $100". If B responded with an echo of that message with the wrong key, then they effectively digitally notarized (vs just encrypting) a fictitious $100 debt. Here is a sample user dialog for S/MIME. Expect similar UIs for Brower based certificates. Notice how the Issuer name isn't user friendly. Note: Speaking of names, if any link in the chain uses an alternate encoding, then clients may not be able to verify the issuer field to the subject. Windows does not normalize these strings during a comparison so make sure the names of the CA are identical from a binary perspective (as opposed to the RFC recommendation). For Suite B compliance, the ECDSA_P384#Microsoft Software Key Service Provider as well as the 384 key size and SHA384 as the hash algorithm may also be selected if the level of classification desired is Top Secret. The settings that correspond with the required level of classification should be used. ECDSA_P521 is also available as an option. While the use of a 521 bit ECC curve may exceed the cryptographic requirements of Suite B, due to the non-standard key size, 521 is not part of the official Suite B specification. If you enroll Certificate Template v3, the private key goes into the CNG private key storage on the client computer. If you enroll Certificate Template v2 or v1, the private key goes into CSP storage. The certificates will be visible to all applications in both cases, but not their private keys - so most applications will show the certificate as available, but will not be able to sign or decrypt data with the associated private key unless they support CNG storage. You cannot distinguish between CNG and CSP storages by using the Certificate MMC. If you want to see what storage a particular certificate is using, you must use CERTUTIL -repairstore my * (or CERTUTIL -user -repairstore my *) and take a look at the Provider field. 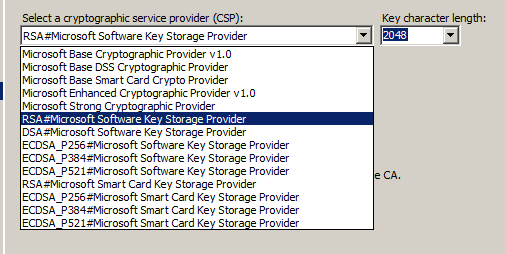 If it is saying "... Key Storage Provider", than it is CNG while all other providers are CSP. Use the Windows command CERTUTIL -viewstore -enterprise NTAuth for troubleshooting Smartcard logins. The local NTAuth store is the result of the last Group Policy download from the Active Directory NTAuth store. It is the store used by smart card logon, so viewing this store can be useful when troubleshooting smart card logon failures. If you deploy two PKI trees, with the intent to decommission the legacy tree at some point (where all old devices have become obsolete or upgraded) it may be a good idea to set the CRL Next Update field to Null. This will (should?) prevent the continual polling for new CRLS to the clients. The reasoning is that once the PKI is decommissioned, there will be no more administration, and no more revoked certs. All remaining certs are simply left to expire. This is a list of commands relevant to configuring a Windows 2008 R2 CA Server. I removed them from the other post since that informative was getting too long, and not all the commands directly relate to setting up a CA. Some requests from the client may get automatically stripped based on these hidden server settings. CertUtil: -getreg command completed successfully. certutil -v -setreg policy\EnableRequestExtensionlist "+2.5.29.32"
certutil -v -setreg policy\EnableRequestExtensionlist      "-2.5.29.32"
The following commands let you set, modify, and delete the Max-Age header setting. This is enabled when the CAPolicy.inf file has AlternateSignatureAlgorithm=1. Be sure to be aware of compatibility issues. Note that there is a change in behavior between Windows 2000 and 2003 CAs. The AKI extension of certificates issued by Windows CAs differs between Windows 2000 and Windows Server 2003. By default, the following information is stored in the AIA extension of issued certificates. Windows 2000 The AIA extension of certificates issued by the CA includes the LDAP DN of the issuing CA (Issuer name), the serial number of the issuing CA’s certificate, and the key hash of the CA certificate’s public key. Windows Server 2003 The AIA extension of certificates issued by the CA only includes a hash of the public key of the issuing CA, also known as the Key-ID. The change in behavior is due to chaining errors that could occur when a CA’s certificate was renewed. The default Windows 2000 behavior could result in incomplete chains if the CA certificate used to sign the issued certificate was not available to the client. 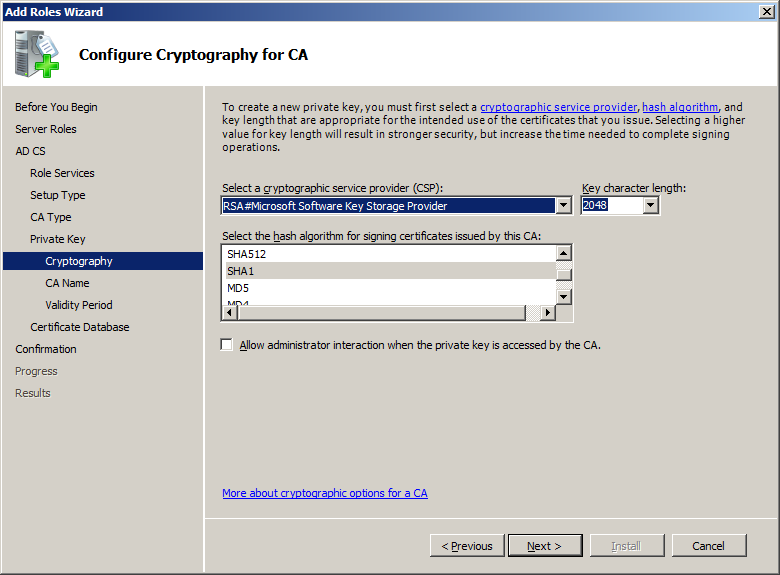 With the Windows Server 2003 default behavior, if the CA was renewed with the same key pair, any CA certificate for the issuing CA that uses the same key pair could be included in the certificate chain. This command will list the certificates published in Active Directory. certutil -viewstore "ldap:///CN=Certification Authorities,CN=Public Key Services,CN=Services,CN=Configuration,DC=contoso,DC=com?cACertificate?one?objectClass=certificationAuthority"
esp. if you implement a CA. Not the answer you're looking for? Browse other questions tagged encryption windows certificates public-key-infrastructure certificate-authority or ask your own question. Why isn't OCSP required by default in browsers? Getting started with SmartCards; what equipment do I need, what do I need to know? who signs the certificate (Root CA or an intermediate authority?